With so many exoplanet search missions in progress, on their way and under development it is hard not to get excited about the prospects of finding alien worlds and encountering extraterrestrial forms of life. But do we really have to look that far? Is there any chance that alien life flourishes somewhere in our own Solar System, right under our noses? The problem with searching for life in Space is that we don’t really know where to look. And even what to look for. At the moment we only have one example of habitable planet, our Earth. Life on Earth comes in all shapes and sizes and is able to survive in a bizarre variety of conditions. But we all have one thing in common: we need water! If we assume that alien life also depends on the water (and that is a big IF), then we can begin our search. Luckily we know where to look for liquid water outside the Earth. One of the most exciting water worlds in the Solar System is Jupiter’s moon Europa. Slightly smaller than our own Moon, Europa has a huge ocean of liquid salty water sandwiched between its icy shell and the rocky interior. The Italian astronomer Galileo Galilei was the first to discover it in 1610. Another Galileo, this time the spacecraft, observed Europa between 1995 and 2000, hinting that this Jovian moon might have a subsurface ocean that contains more water than we have on our planet. The water under the icy crust doesn’t freeze thanks to the heat produced by tidal flexing: as Europa moves around Jupiter on its elliptical orbit, the gravitational pull from the giant planet makes the moon bulge. The bulge is always pointed to Jupiter’s center. But because Europa also spins around itself, at different times the bulge corresponds to different areas of the moon’s surface. That makes Europa flex back and forth! This Monday (May 14, 2018) NASA hosted a live science chat about Europa and its being the priority destination for search for life. One of the guest speakers, Dr Xianzhe Jia of the University of Michigan shared with the public his recent findings (they were published on that day in the Nature Astronomy Journal). 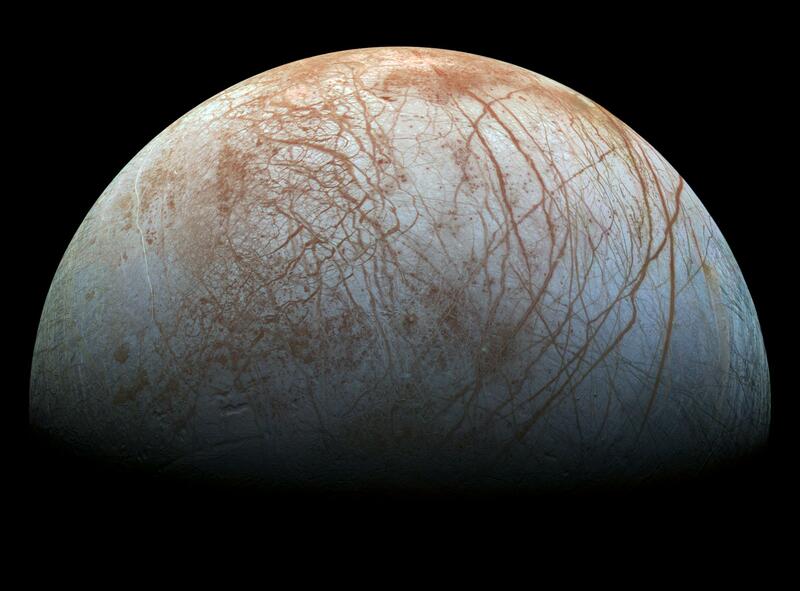 He announced that his team’s research confirms the existence of the plumes of water above the surface of Europa. Prof Jia explained that a few years back Hubble spotted plumes rising 200-400 kilometers above the moon’s surface. That inspired Jia to look at older data from NASA Galileo spacecraft. One of Galileo’s close flybys (less than 150 km above the surface) revealed signatures, namely bend in the magnetic field and increase in plasma density, that were not understood back then. It turned out that the location of the anomaly corresponds to the location of possible plumes photographed by Hubble. Dr Jia and his team performed computer simulations and showed that the “signatures” detected by Galileo are consistent with what we would have seen if the orbiter have traveled through the plume. Therefore, not only Europa is likely to have an ocean of liquid water, but also we might be able to sample that water without having to actually land on the surface and drill through the kilometers of ice. Instead we will simply fly through the plume! And there is a mission that is going to do just that! Europa Clipper is a spacecraft that NASA is currently designing to explore Europa. If all goes well, the spacecraft will take off in 2022 and arrive to its destination in 2029. Europa Clipper is an orbiter. But instead of orbiting Europa it will orbit Jupiter and perform 45 flybys of the Jovian moon. The closest planned approach is 25 km! The primary goals for the mission are to confirm the presence of liquid water and to investigate its chemistry, to observe plumes and other potential surface activity. It will be also scanning the surface in search of a landing site for the following landing missions! Sounds very exciting! And don’t forget to book your planetarium school visit to learn more about Europa and search for life in Space!